Farming terraces ( Andenes ) surrounding the whole side of a mountain decorating this ancient Inca castle with temples, buildings and water channels. The stonework is high in quality and fine masonry with a magnificent sequence of fifteen ritual fountain baths. It was a religious centre, probably associated with the ritual worship of water. Chachabamba, Choquesuysuy and Inti-pata are other very interesting Inca Complexes hiding in the middle of the beauty of the mountains and the lower part of the Sub-tropical valley. We walk to Machu Picchu until “Inti Punku” the sun-gate, have unique views from this mountain top, after 40 minutes you will be on front of this wonder and majestic place for sunset, then we board a private bus to Aguas Calientes town. Spend the night in a comfortable Hotel Viajeros. 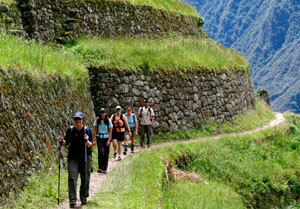 Next morning early we return to Machu Picchu by bus for a guided tour, visit and explore. DAY 1: OLLANTAYTAMBO- KM 104 CHACHABAMBA WIÑAY-WAYNA-MACHUPICCHU-AGUAS CALIENTES. We leave Cusco 04.00 am from cusco to ollantaytambo train station in our private transport and then we take them our train to Km 104 (chachabamba village) where the trek starts. Upon arrival we visit the ruin of Chachabamba in 2250 masl. Here agricultural product from other areas where collected to be brought to Machu Picchu. 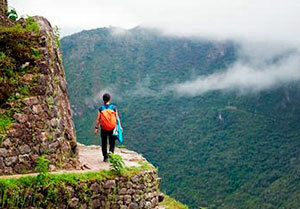 Then we begin our walk towards Wiñay Wayna. On the way we have beautiful views of the Urubamba river and the chances are many to see different kinds of the famous orchid family. We turn around the last corner and have the amazing Wiñay Wayna vew below us, we stop to make a visit of this interesting and important inca site. After a few minutes walking we stop for lunch. In the afternoon we walk the last hours towards Machu Picchu, that we see on a distance from the Inti Punku (Gate of the Sun) in the beautiful afternoon sun before continuing down to Aguas Calientes. We spend the night in a nice hostal in town. 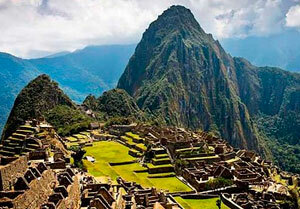 After breakfast we will take the bus with direction to archeological site we’ll arrive at Machu Picchu ruins (2400 m). Guided tour of the ruins for approximately 2 hours followed by some time at leisure for lunch. In the afternoon, we take the train back to ollantaytambo train station and we have our transport to return Cusco, upon arrival transfer to cusco . End of services. . The train departs AguasCalientes late in the afternoon. ( 18:30 pm to Ollantaytambo then a 2 hours transport to Cusco arriving at 22:30 pm approx. Free safe Storage in Cusco in our office while you are hiking.